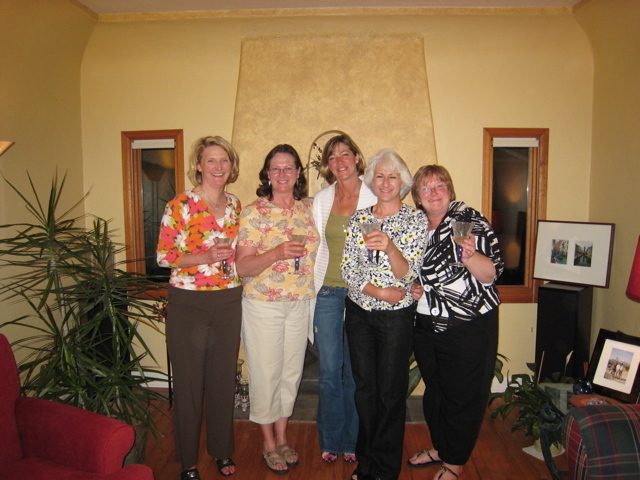 Lisa Dahl, Dorothy Kreps, Sue Emil, Theresa Murphy and Betsy Holt. The other members, Julie, Linda and Jan, received royal dispensation for not being there that night. This club really didn't seem like they were terribly new, as they all appeared rather chummy (does anyone still use that word?). Maybe it was the Jubilees they were serving from the Coronation chapter of my book. One of the more interesting questions was about friendship with one's spouse. Could you spend 24/7 together? And, if you did up and leave your home for a year or longer, how would you deal with missing your friends? Can a spouse fill the void? Can he be your best friend? Fascinating discussion that Lisa told me the group continued afterwards. Anyone else care to weigh in? What are the different things you get from friendship with your spouse vs. girlfriends? And, could you leave your girlfriends for a year - or longer to be with your husband 24/7? I met my husband 22 years ago. We had many similar interests but both of us only wanted "to be friends" and nothing more. Of course we fell in love and here we are 22 years down the road RVing a couple of times a year. We are considering taking a year and RVing once he retires. I'm not sure about 24/7, but since he's my best friend, I think I'd like to try it. We've been having an interesting discussion about this on my facebook wall (http://www.facebook.com/DoreenOrion - feel free to join if you're on FB). Some women are adamant that they don't want their hubbys to be their best friends, others love it that way. One full time RVer seems to have it both ways: her hubby lives with her only 2 weeks out of every month, as he works on an oil rig. The two months he's not with her, she is in constant touch with her girlfriends, the rest of the time, not at all. It's been an interesting discussion of what we get from husbands vs. girlfriends. Personally, I'm with you: Tim's my BFF and that's just fine by me. This page contains a single entry from the blog posted on June 12, 2009 12:06 PM. The previous post in this blog was An Educated Book Club. The next post in this blog is How Did I Ever Miss Barbeque?.